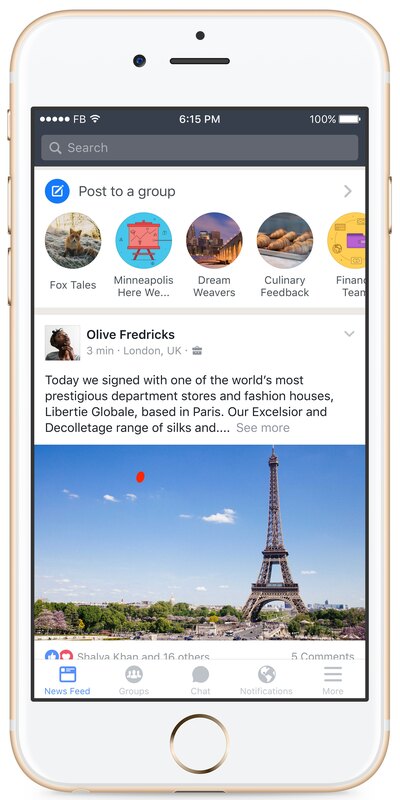 Introducing Workplace by Facebook | Constellation Research Inc.
Today Facebook officially launched Workplace by Facebook, their enterprise version of the Facebook social network. Workplace, formerly named Facebook at Work has been in private beta for over a year and is being used in over 1000 companies, dozens of which have more than 10,000 people using it. Current customers include Coldwell Banker, Club Med, Heineken, Royal Bank and Scotland, Canadian Tire and Telenor. Workplace is now available for any organization to signup. 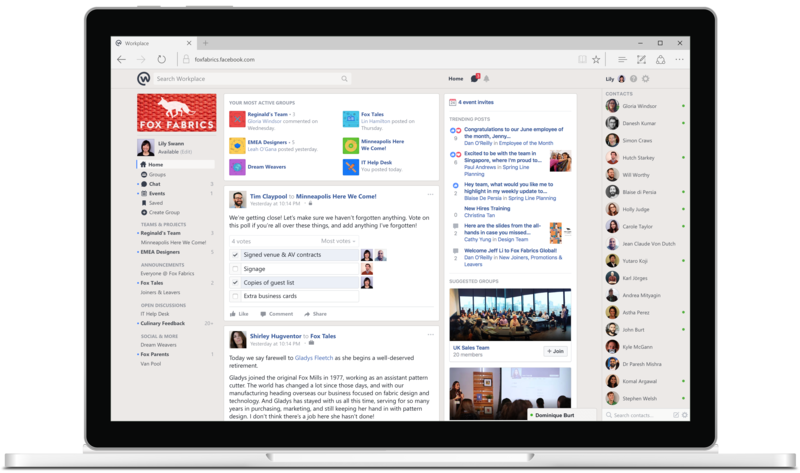 Workplace resembles the consumer version of Facebook, with a central newsfeed of posts, groups for specific topics, and a messenger client named Work Chat that provides group chat and 1:1 video. Some of the key Workplace features include events, polls and live streaming which allows organizations to broadcast content to employees in real time. It should be noted, Workplace was the name IBM gave to their next generation messaging platform in 2003, but was discontinued in 2007. As outlined in my research report, “Can Facebook at Work Bring Collaboration to the Business World”, one of the greatest strengths of Workplace is that most employees will immediately be familiar with how to use it. The real test comes in how seamlessly integrated Workplace can become with the business workflows that employees use to get their jobs done. At the time of launch, Workplace does not have integrations with popular enterprise software such as Office 365, Salesforce, Workday, ZenDesk, etc. Instead, Facebook has focused their initial development efforts on the security and administration aspects of Workplace. For example, customers will be able to use single-signon via providers like Microsoft Azure AD, PingIdentity, Okta and OneLogin. While SSO is critical for getting started and gaining adoption, Constellation Research recommends that Facebook quickly develop business software integrations or partner with companies that can provide this functionality. Workplace does allow for multi-company groups which contain people from other organizations. This is extremely important for many collaborative use-cases, but the caveat (at this time) is that each organization must be using Workplace, there is currently no guest access. Can Workplace Compete With A Suite? The main collaboration battle over the last few decades has been fought by Microsoft, Google and IBM. The core of these vendors' offerings is the combination of email/calendar + content creation (documents, slides, spreadsheets) + unified communication (chat, web-conferencing). Along the way vendors offering niche services such as file sharing (Box, DropBox, Egnyte, etc), task management (Asana, Clarizen, Trello, Workfront, etc) and group chat (Slack, Glip, HipChat, Ryver, etc) have each claimed their own spot in the market, but always as a layer in addition to the Microsoft, Google or IBM stacks. Workplace by Facebook is not a complete collaboration suite. Since it does not provide its own email, task management, file-sharing or content creation tools, customers will still have to purchase those other products. So can Workplace succeed as a Corporate Social Intranet or Enterprise Social Network? Options such as Yammer, Jive, SocialCast, Thoughtfarmer, and Igloo have been around for years, yet none have dominated the market the way suites like Microsoft’s Office 365, Google's GSuite (formerly Google Apps for Work) and IBM Connections have. Also vendors like Salesforce, Workday, SAP, Oracle, Cisco and Infor have all added communication and collaboration features into their platforms. In order for Workplace by Facebook to really become a critical business tool, they will need to provide deep integration with email, file-sharing, task management, and as mentioned above business process software such as CRM, ERP, HR, financial, etc. or else they risk the same fate as many social business software platforms that came before them. So can Workplace provide enough value on it’s own to warrant being an additional tool for employees to use? If early customer interest is any indication, it would appear it can. Leveraging Facebook’s name recognition, Workplace has a big opportunity to become a leader in enterprise social software. Look at the level of attention newcomer Slack has obtained, and that was starting from ground zero. Slack claims to have 3M active daily users, it will be interesting to see how many Facebook cites in 6, 12, 24 months. The strengths of Facebook’s name recognition and massive business partner ecosystem are certainly assets that can help their road to success. Constellation Research has already received a great deal of customer interest in Workplace (when it was Facebook for Work) and expect interest to increase with today’s official release.